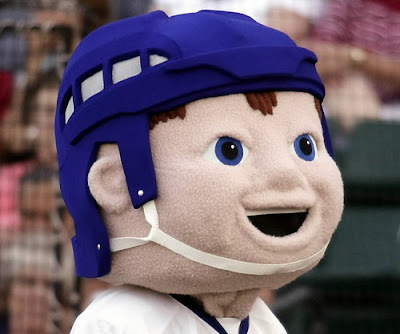 That Fargo mascot is plain creepy, don't you think? The Ice Box in Lincoln, Nebraska will be the scene when the Lincoln Stars and the Fargo Force tangle with one another Saturday night. This will be the sixth time the Stars and Force have played each other this season, with the Stars leading the season series 4-1. The Force have won eight of their last ten games, and are currently in second place in the USHL West Division with 65 points. The Stars are in first place in the West Division with 73 points. With a win against the Force Saturday night, the Stars can clinch the West Division regular season championship...and more importantly, home ice advantage in the playoffs (against West teams). The Force are led by goaltender, Mike Lee. Lee is a highly ranked prospect, and will most certainly be a NHL draft pick this Spring. Lee has accumulated 24 wins this season with the Force, and is the big reason why this expansion team has played so well this season. Lee is 1-2 against the Stars this season, while posting a .923 save percentage, and a 3.34 goals against average in those three games. The Force also have one of the hottest goal scorers in the USHL right now, forward Andy Taranto. The former Omaha Lancer has posted an incredible 13 goals in his last 11 games, and at one point had scored at least one goal in 10 straight games. Taranto is second in the USHL in goals scored with 28. Not too shabby for a guy who only scored a total of 7 goals in 47 games last season while playing for the Ohio Jr. Blue Jackets. The move to Fargo has done wonders for Taranto. In five games against the Force this season, Stars forward Kirt Hill has netted 5 goals and 4 assists for a total of 9 points in those five games. Netminders Anthony Borelli and Kevin Murdock both have two wins a piece against the Force this season, each with respectable numbers in those wins. Considering Kevin Murdock started in net against the Gamblers Friday night, I expect Anthony Borelli to start against the Force in this game. Lincoln has fared well against the Force this season, but a majority of those games came in the first half of the season when the Force were struggling to find out what kind of team they were. Now that they have leveled out and have been more consistent with their play, I expect the Force to give Lincoln all it can handle in this game. The Force are arguably one of the hottest teams in the USHL right now, and will be looking to get their first win at the Ice Box. As USHL expansion teams go, this Force squad is a very good one. Head Coach Dean Blais, like his counterpart in Green Bay, is doing a fantastic job as a rookie USHL head coach. The Force play smart, defensive hockey, and very rarely do they get blown out. This should be yet another great game, folks. This Force team does NOT play like an expansion team. I expect the Force to fight tooth and nail in this game, despite their not so sucessful attempts in the past at the Ice Box. There is a lot riding on this game for the Stars...it should be interesting to see how they respond, and if they can clinch the West. Thoughts on this game? Can Lincoln continue their winning ways against the Force? Will you be bidding on a jersey? Hopefully there are some pictures of the jerseys. Lincoln usually has some pretty cool looking ones. This one oughta be a great game. The Force went on the road last week and lost two shootouts, one at CR and the other at Waterloo who is on a 6 game run right now. Fargo rebounded and beat Tri City and Sioux City. The Stars are coming of an emotional hard fought come from behind win vs Green Bay, and that was on the heals of the brutal 4 games in 5 nights road trip out east. This game doesn't set up too well for the Stars. If they win this one they will have done very well.